Last week a fellow mom said that if she serves another ear of corn or a tomato to her family, they will boycott her dinner table. You could easily reach corn and tomato overload at this point in the season. We eat tomatoes with almost every meal and corn hits our table a couple of times a week. How to pass a farm stand and not stop, I’ll never know. Come the freezing dark months of winter, I’d regret not having taken advantage of all this fresh delicious produce. If you’re organized (which I’m not), and think in advance (which I don’t), you can easily freeze fresh produce. Doing that might not leave you as sad as the rest of us in January. Even with the best of intentions, I can’t seem to get my act together to freeze anything. Other than ice cream and frozen peas, what goes into our freezer never seems to come out. Alas, we do without the summer’s bounty when the snow starts to fall and I focus on root vegetables. Who doesn’t love some roasted butternut squash? 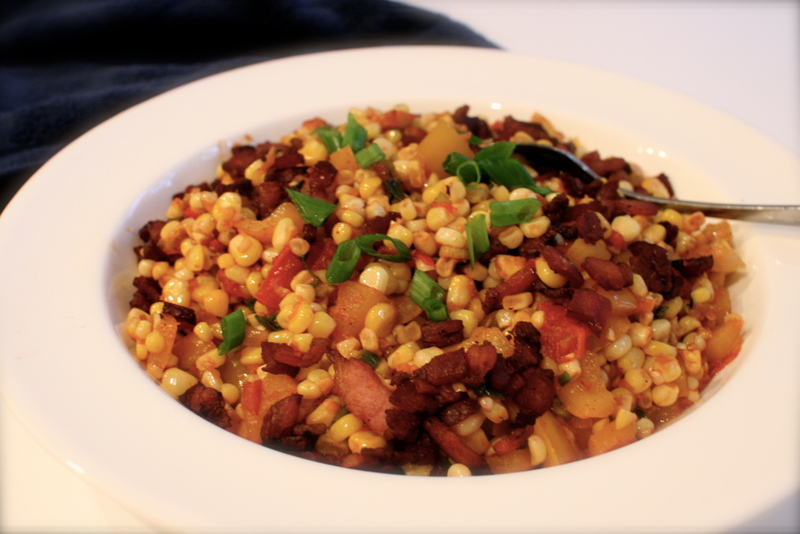 With corn still at the farm stands and a few slices of smoky thick cut bacon on hand, I made this side dish sauté. Who came up with that brilliant thought everything’s better with bacon? If you prefer to go meat-free, just leave it out. 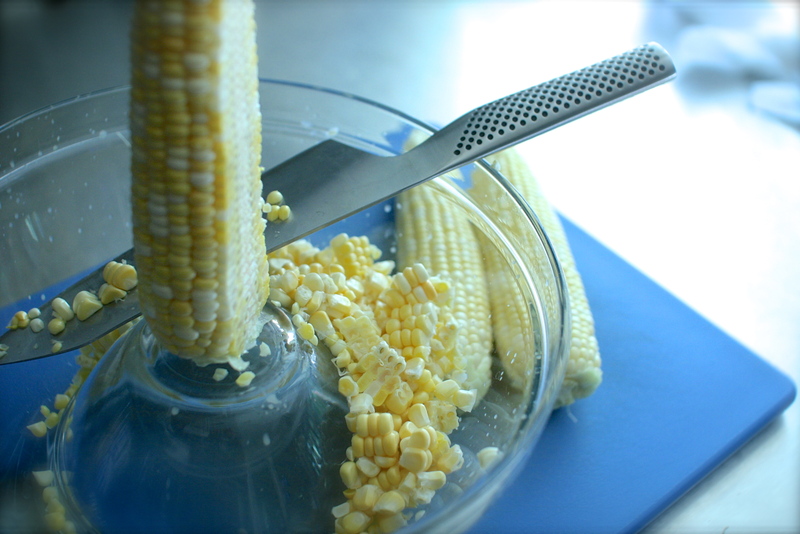 If I recall correctly, it was Rachel Ray that I saw on TV cutting the corn off the cob this way. Genius! Just place a small bowl upside down inside a larger bowl. Steady the ear of corn on top of the small bowl’s base and cut the kernels off. They fall right into the bowl and not all over your counters. When you’re done, just carefully insert the tip of your knife under the small bowl to get it out. Voila! No chasing corn all over your kitchen. Heat a large sauté pan over medium-high heat. Add the olive oil and bacon to the pan, stir occasionally until it crisps up. Using a slotted spoon, remove the bacon from the pan and place it on a paper towel lined plate, set aside. Pour off all but one tbsp of the bacon fat. Truth be told, I put mine in a container and have it in the refrigerator. Never know when you can use a little bacon fat in the future. Add the diced shallot and peppers to the pan, sauté until they begin to soften. 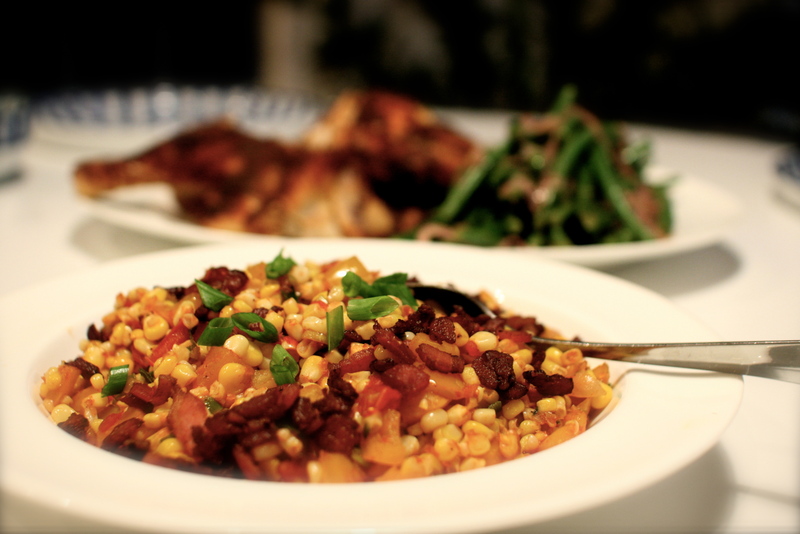 Reduce the heat to medium and add in the corn, tomato, scallion and fresh thyme. Stir to combine and cook for 3-5 minutes, until the corn is tender. Add in the crispy bacon to the pan and season with salt and pepper to taste. Give a final stir and garnish with the scallion greens. 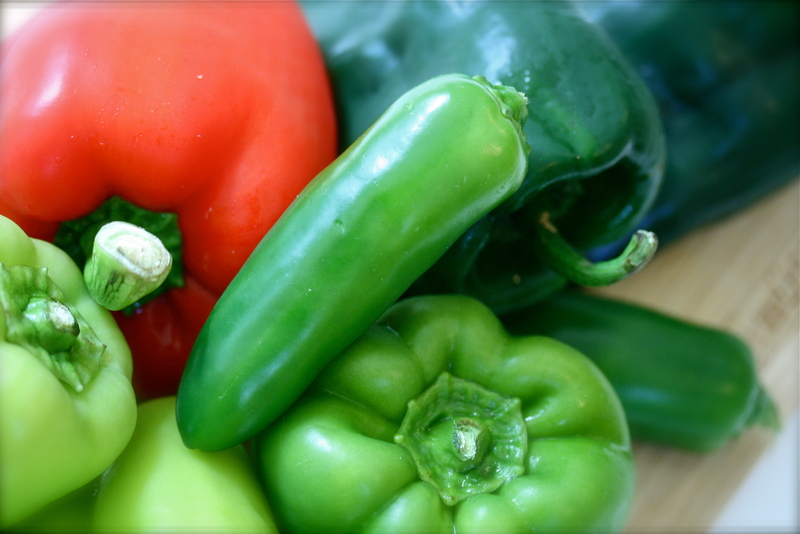 We’re in the middle of summer which means lots of fresh vegetables. Hopefully everyone is taking advantage of the summer’s bounty. Support your local farmers! I haven’t been picking at our farms this season, just buying. People come from near and far to visit our historic little town and its beautiful farms. They come to pick-their-own and will do so joyfully regardless of the temperature. Like them, I relish the splendor of it all. I come home proud of my overflowing baskets of local goodness and stare in bewilderment, thinking – whose going to eat all this? Like last year when I picked 8 quarts of strawberries or the time I picked 13 pounds of apples. This summer you can call me lazy. Schlepping into the fields in the summer heat has just seemed like punishment. 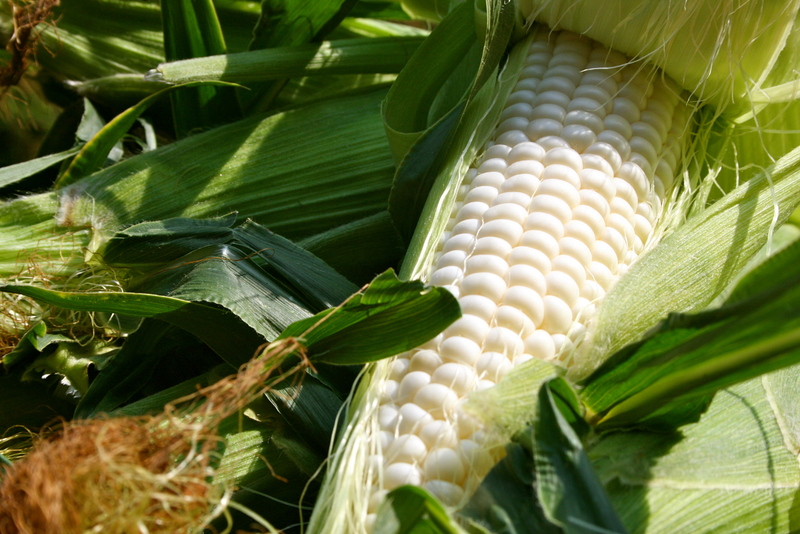 So in the spirit of laziness… I bought some fresh corn at the farm stand and wanted to make something flavorful, healthy and a little more exciting than just plain corn on the cob. There was a nice assortment of fresh peppers at the farmer’s market, so I grabbed a bunch to make this perfect-for-summer side dish. I know 8-10 peppers may seem like a lot, but the peppers I used were small. After they were charred, cleaned and diced, I probably had less than 2 cups. I made this Mexican style, to serve with fish tacos (recipe coming soon). This would be equally delicious using fresh basil in place of cilantro, omitting the cumin and chili powder. Remember, if you’re using hot peppers the heat is in the seeds and membrane. Keep them if you like it super spicy or stick to bell peppers for a milder flavor. 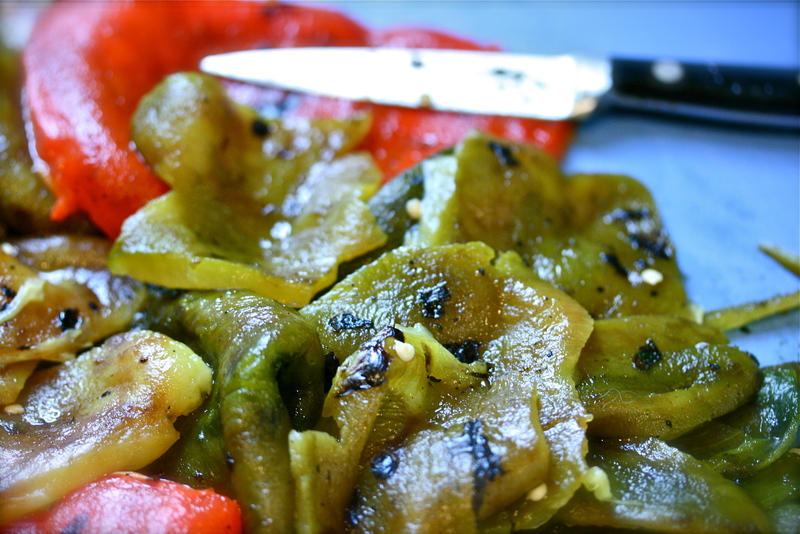 I used our outdoor grill… Place the whole peppers, no oil needed, directly on the grill, preheated on medium-high. Turn the peppers occasionally until the outsides are nicely blackened and charred. No worries, when you peel them they will be perfect. Once black all over, place the whole peppers in a large bowl and cover with plastic wrap. Allow to sit in the bowl until they are cool enough to touch. Not so pretty, but perfectly charred peppers. On a cutting board, remove the black exterior of each pepper – they will peel very easily if you rub them gently with your fingers. Remove the seeds and core, then dice. For this recipe I cut the red pepper into thin strips and diced the others. I thought it looked pretty. 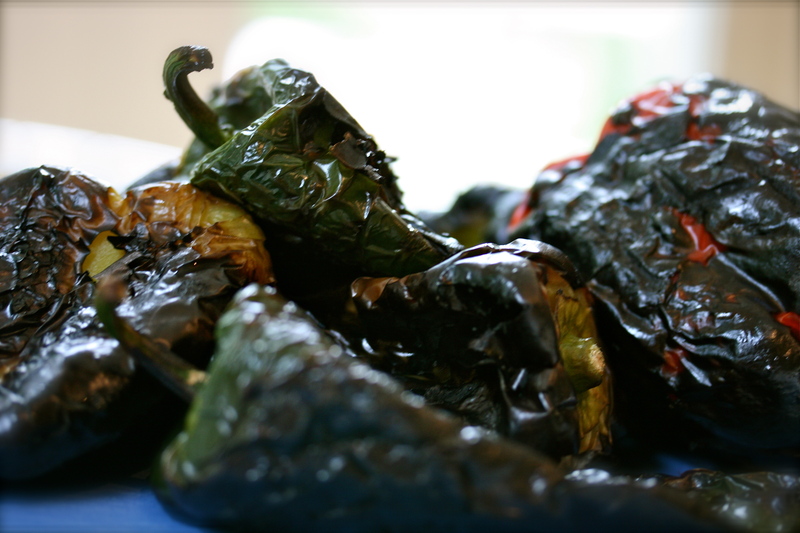 Charred peppers ready to enjoy. That’s it. If you don’t use all the peppers at once, you can store them covered in olive oil in the refrigerator for a couple of days. Yummy! Heat a little oil in a large sauté pan, and add the onion and sauté until translucent. 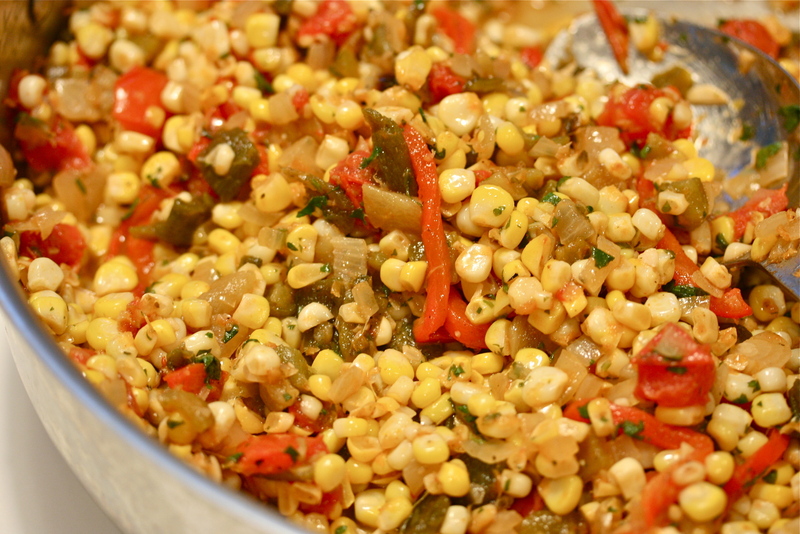 Add the garlic, cook until fragrant, and toss in the corn kernels and diced charred peppers. Sprinkle with salt, pepper, cumin and chipotle chili powder. Stir until combined. Add the chopped tomatoes, stir and allow to simmer. The tomatoes will release their juices. 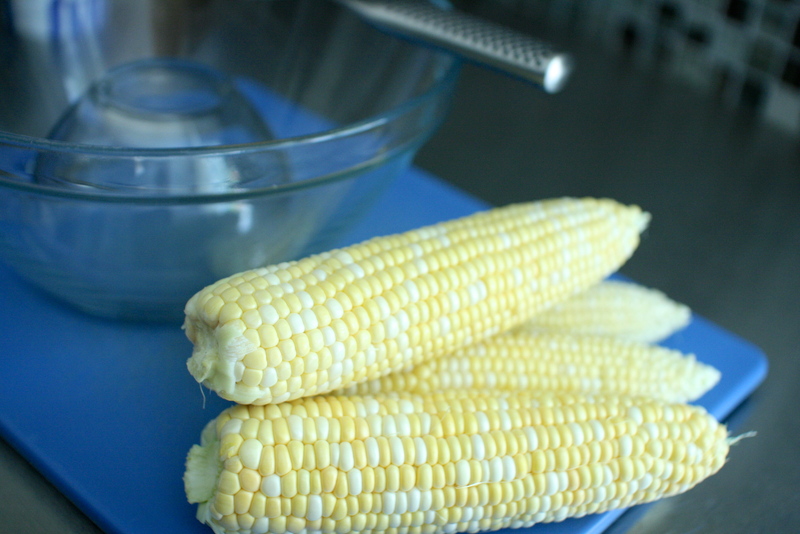 After about 10-15 minutes, taste the corn for seasoning and adjust as needed. 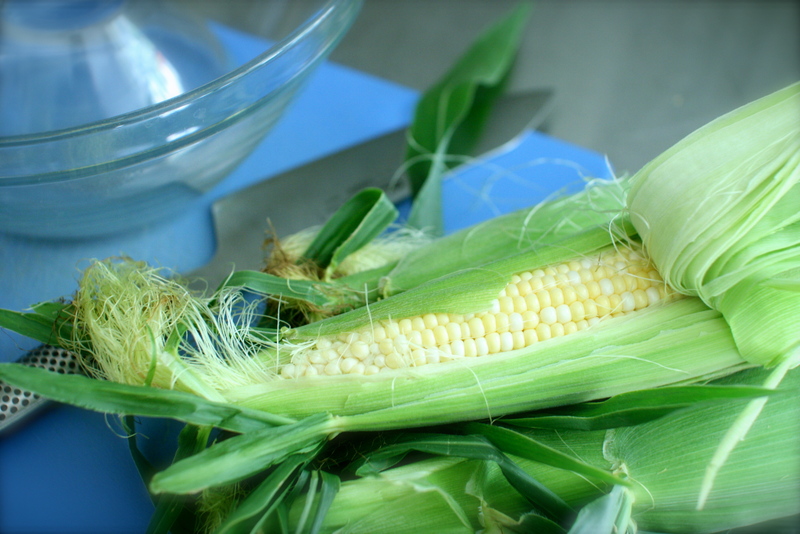 Once the corn is tender, add the lime juice, toss in the fresh cilantro and serve. It’s even good cold the next day.